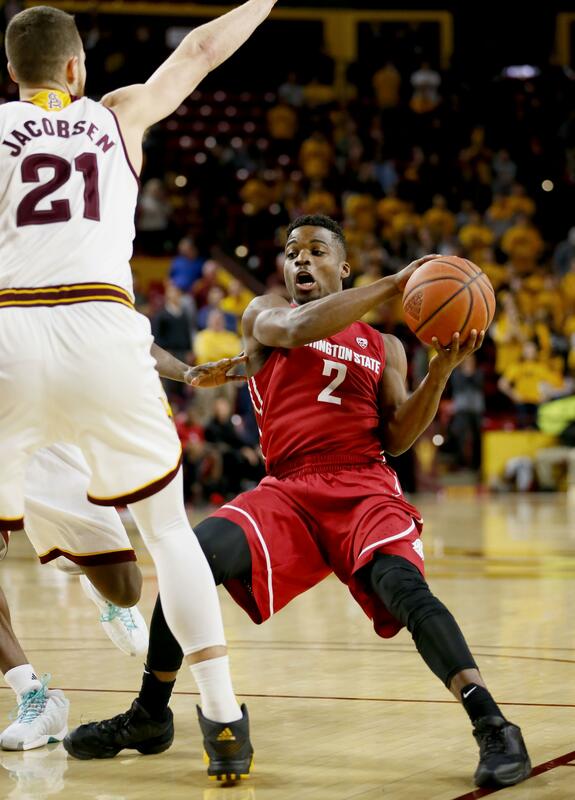 PULLMAN – Ike Iroegbu is making 52.3 percent of his 3-point attempts. Should that number fail to suitably shock you, consider that it is nearly 20 percent higher than the 35.6 percent he hit from downtown last year. Think also about the fact that Stephen Curry has broken the NBA with his relentless bombing from all over the court – even if you don’t follow the league, you’ve heard – and recognize that Iroegbu is hitting his 3-pointers 7.2 percent more often than former Cougar star Klay Thompson’s Splash Brother. Iroegbu’s improvement from long range is remarkable – the result of offseason drilling with Washington State’s graduate manager, Robert Johnson, who set lofty shooting goals for the Cougars guard. Sometimes Johnson would tell Iroegbu he had to make 3,000 jump shots in a given week, sometimes a different mandate. His ability to teach himself a new trick so effectively is impressive in its own right. But the reason Iroegbu has become WSU’s second leading scorer, behind Josh Hawkinson, is because of substantial improvement at his long-preferred method of getting points. When Iroegbu takes a shot at the rim – a shot he can get when he wants thanks to a blinding first step and an unpredictable ability to change speeds while dribbling – he scores 68.1 percent of the time. Last year, when driving was a much better option than long-range shooting, Iroegbu’s shooting percentage at the cup was a mere 48.8 percent. Against Pac-12 opponents he is now shooting 59 percent on 2-pointers, compared to just 40 percent last season. Thanks to his efficiency scoring inside and out, Iroegbu has scored in double digits in all but three games for WSU (9-8, 1-4 Pac-12). He hasn’t learned any new moves. He’s just learned not to move his eyes. Iroegbu grew up with two brothers. Chuks is the oldest; he walked on at WSU. Uchenna, the youngest, plays for the College of Southern Idaho. When the trio would play at the local 24-hour Fitness establishments in their hometown of Sacramento, California, neither was about to let the middle child sit on the perimeter and knock down 3-pointers all day. If Ike Iroegbu wanted to score, he had to earn it by going directly to the rim and accepting whatever contact came along with the shot. Oak Hill Academy, with its 40-plus games schedules and enough talent to field an NCAA tournament worthy team, prepares some of the country’s finest prep players for college. Iroegbu and his teammates at the Virginia boarding school were able to breeze through games, honing their no-look passes and acrobatic layups against opponents who were ill-equipped to make them pay. However, in college Iroegbu often frustrated fans and himself because he made getting to the rim look so effortless, but converted less than half the time he got a shot off. Putting on some muscle this offseason helped, as did becoming more decisive in his shot selection – 60.9 percent of his shots occur within the first 10 seconds of a possession. Last year that number was 45.2 percent. In the overtime loss to Washington, Iroegbu scored 29 points, using a variety of difficult scoop shots and layups near the rim that in the past might have rimmed out. He continued his productivity near the rim in losses last weekend against the Arizona schools. Since Dec. 25, Iroegbu is shooting 63 percent from the field. Ernie Kent believes that Iroegbu’s improved 3-point shooting has helped significantly. But according to Iroegbu, the biggest difference is just his focus, specifically remembering to keep his eyes on the rim at all times. Published: Jan. 21, 2016, 1:18 a.m.